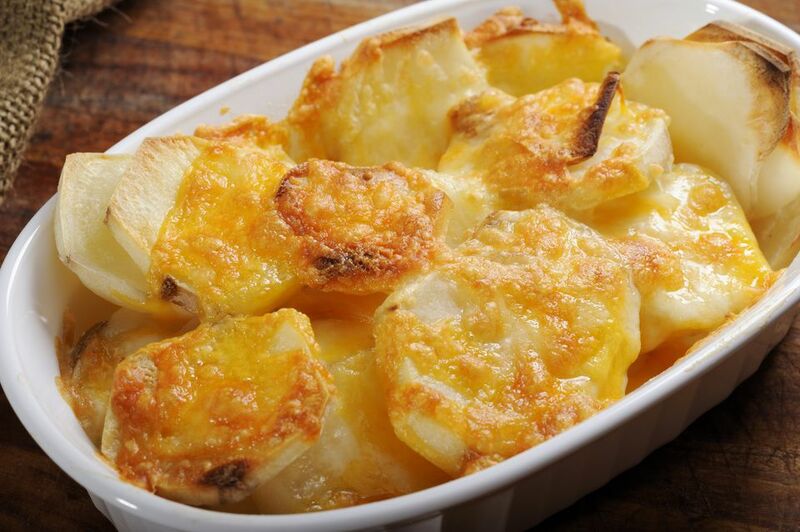 My family loves my favorite scalloped potatoes recipe, but it takes an hour and a half to bake. When we want to enjoy scalloped potatoes but don't have much time, I make these quick microwave scalloped potatoes. Use the food processor to slice the potatoes to save even more time. Find a 9 x 13 baking dish or a 2-quart gratin dish that fits in your microwave, and spray it with cooking spray. Peel potatoes. Use a knife or food processor fitted with the slicing blade to slice potatoes into 1/2-inch slices. Stir together cream of mushroom soup and milk in a large bowl. Add potatoes. Stir to coat the potatoes well. Pour into the prepared pan. Cover loosely with plastic wrap, folding back a corner to allow steam to escape. Heat in the microwave on high 5 minutes. Rotate the baking dish and heat on high another 5 minutes. Stir. Top with cheese. Heat another 10 minutes or until the potatoes are fork tender.